What can I say about bread baking that hasn’t been said already? How can I define and describe the feelings it gives you? For me bread is the quintessence of life. Bread is one of the oldest prepared foods and this is one of the reasons I respect this process so much and try to bake as many bread types as I can find. It is magnificent how from more or less the same ingredients you can get so many types and flavors of bread, how simple things as water, flour and yeast can give such comfort and can make one feel so at home (ever smelled a bread just popping out of the oven). Today’s bread is Ciabatta. Ciabatta was first produced in Liguria. 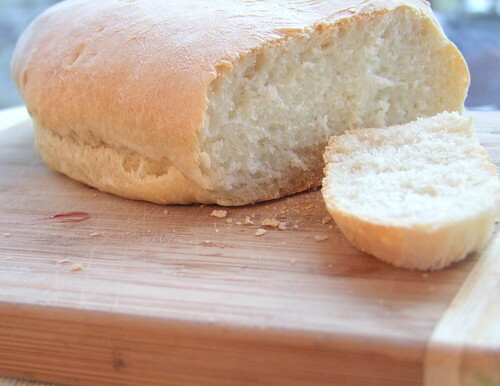 Ciabatta is Italian for “slipper” due to its flat general shape. 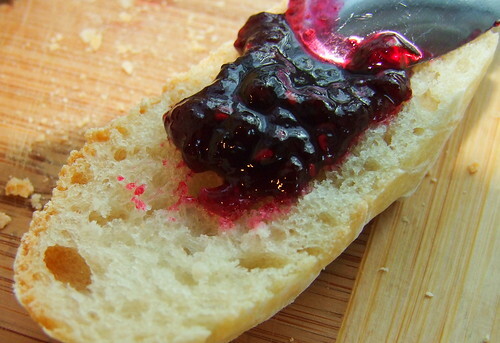 Ciabatta isn’t as puffed up as many other types of bread, in part because of being made with very wet dough. The high hydration level of the dough facilitates the formation of holes. Another great byproduct of the wet dough is the signature chewiness not found in the regular ole’ sandwich bread often found in mega-marts. One characteristic of Ciabatta is that it starts with a sponge or a biga. Let the yeast dissolve in the warm water for about 5 minutes, until creamy. In a bowl, mix the flour, the water and the yeast mixture – mix it for 4-5 minutes. Cover the bowl with plastic wrap and let it sit at room temperature for 12 to 24 hours. Let the yeast dissolve in the warm milk for about 5 minutes, until creamy. Mix the biga, the milk-yeast mixture, water, oil, flour and salt and knead it a little bit. I then let it rest for 2-3 minutes and knead it for 10-15 minutes until the dough passes the window pane test. Lightly oil a bowl, put the dough inside turning to coat. Cover the bowl with plastic wrap and let it rise until double in volume (1.5-2 hours). Prepare a large baking sheet covered with 2 pieces of well floured parchment paper. Turn the risen dough onto a floured surface and cut in half. Put each piece on its own floured paper and shape into an 20-25 cm long oval. Sprinkle a little flour on the loaves and cover with a kitchen cloth. Let them proof for about 1.5-2 hours until almost doubled in volume. 45 minutes before baking the bread, preheat your oven to 225 degrees. 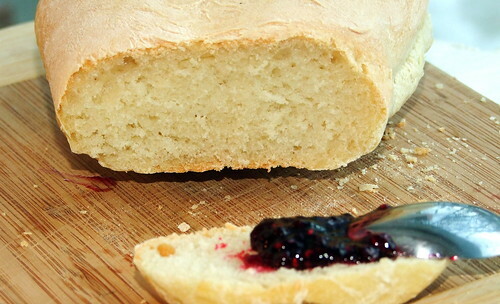 It is great if you have baking stones, but making Ciabatta works just fine without them. Bake for 20-25 minutes, until the top is golden brown and the bread sounds hollow when tapped on the back. I hope you will enjoy it as much as we did fresh from the oven and smelling divine.